But before we get into the reviews, let’s have a look at what an electric violin is. The Electric Violin: What Is It? Everyone knows about acoustic violins, that they have a bridge, use strings, and a bow. But when it comes to electric violins, there’s a lot of mystery surrounding them. The answers to those questions are no and yes respectively, but let’s look closer. The components of an electric violin are very similar to an acoustic violin. There’s a bridge, strings, tuning pegs, a bow, and a fingerboard. However, the differences are the body, and the embedded electronics. Many people expect an electric violin to have different strings to a regular one, but you don’t have to worry about that, as you can use normal violin strings on both an electric violin, as well as an acoustic one. The electronics themselves are very similar to an electric guitar, with pickups built in to transfer the sound from analog to digital, which can then be played through a portable amplifier. Now it should be noted that although electric violins are often called silent violins, they do make a ever-so-slight noise. However, the volume that comes out of the amplifier will be far from quiet, as some professional electric violins have built-in preamps for added sound clarity and performance quality. Normally though, there will be a small volume knob for adjusting the volume on the fly. That’s not to say that “pure electric” violins are the only ones out there. It should be noted that you can get acoustic-electric violins too. These are acoustic violins, with pickups installed within the body. This gives the weight and feel of an acoustic violin (as well as the acoustic benefits), whilst still giving you the power of an electric violin. So now that you know the basics of an electric violin, which one should you buy? Well, although there are some that many professional violinists swear by, this guide should by no means be taken as gospel. When choosing a beginner’s electric violin, often the main deciding factors will be a combination of affordability and comfortability. So this means that you should be looking at both how much a beginner violin costs, as well as how it feels to play. A cheap electric violin might be easier on the wallet, but harder on the hands and elbows. There are also various kinds of electric violins. You get the beginner ones, which range in price up to $200, and then you get the more fancy Yamaha electric violins, which can go up to $2000 and beyond. Just because a violin is cheap, or expensive, that doesn’t mean you should go for it though. You need to have a look at the benefits that the violin offers, as well as testing out the feel of it before deciding that you need to get that particular one. Over and above that, you also get what’s called acoustic-electric violins, a few of which we have mentioned below, as they are simply brilliant instruments for beginner, intermediate, or advanced electric violin students. Arranged below in a low-to-high price range, are some electric violin reviews to help you in your decisions. Possibly one of the best electric violins for a beginner all-round, the Crescent EV is perfect as a beginner electric violin. It’s affordable, comes in various colors, and has a decent tone and feel. For someone starting out on violin, this is a perfect entry-level model in the world of silent violins, as they can be found at under $100. 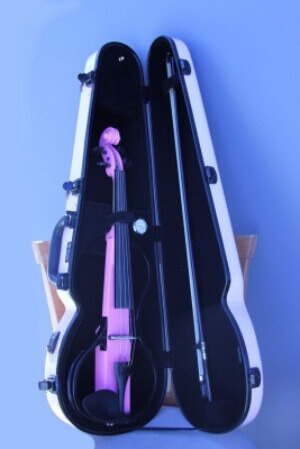 It’s really one of the best beginner electric violins due to the affordability, and ease of playing, and because of the variety of colors it comes in, this makes it an awesome electric violin for young students. If you’re looking for a cheap electric violin, that you can use on the odd occasion to experiment with, or simply something for your child to start playing violin on, this the Crescent EV is probably your best choice for a basic electric violin. Another great electric violin for those with a tight budget, the ViolinSmart EV20 combines affordability with funky colors and sounds. 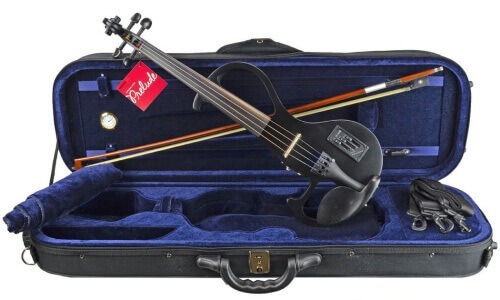 This violin features a headphone jack, a lightweight body, and a padded violin bag for storage. For under $100, you can afford to use this violin for experimentation when it comes to a student electric violin, as the affordability makes up for the quality that you’d require in a professional electric violin. If you’re looking at trying out an electric violin as a beginner student, or as an experimental musician, then the ViolinSmart EV20 is an excellent choice for you, as the price allows for you to buy one with little to no dent against your monthly budgets. The tone is what you can expect from a cheap electric violin, but it’s better than the price you’re paying for it, so overall it’s a good choice as one of the best electric violins for practice and experimentation. One of the bigger names in the violin world is Merano. This model of their electric violins is nothing short of brilliant. Coming in at under $200, it means that it’s still one of the best intermediate electric violins on the market. The body is made from carved maple, which gives it a nice “real wood” feel that is often missing from most electric violins. 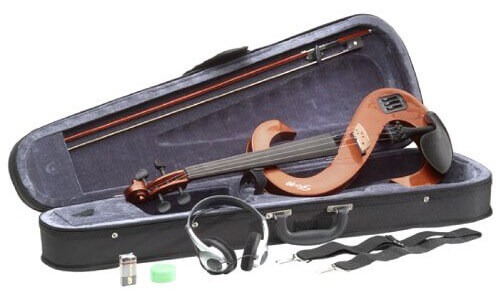 In terms of violin kits, this is probably the best inexpensive electric violin kit, as it comes with a variety of accessories and extras, for the beginner and intermediate violinists alike. Overall, there isn’t any reason for a beginner or intermediate electric violinist to NOT get this violin. For the price you’re paying, this is probably the best electric violin for the money you’re paying, as it is probably the best intermediate electric violin in the price range. It could even be called the best electric violin under $200, as Merano guarantees that the quality of their instruments is such, that they would be happy to play them too. One of the more modern brands of violin on the market, Cecilio has made their name in both acoustic violins, and electric violins alike. With the CEVN-2, their name is shown to be a staple one in the electric violin market. This violin boasts a hand-carved maple body, complete with mother of pearl inlays, and fittings made from ebony. For just over $100, it’s no wonder that this electric violin made it onto our list of the best electric violin reviews list. 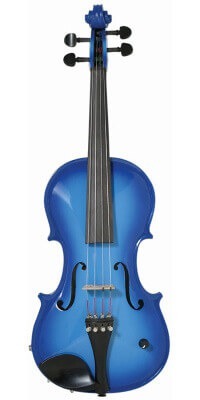 This is probably one of the most popular entry-level violins for new students, as it comes in various colors as well as styles. This gives uniqueness a whole new flavor for electric violinists. This is a great silent violin for anyone wanting to practice at home. The added benefit of headphones being included, is that you can practice pretty much anywhere that has enough space to move your elbows and arms. The quality that Cecilio provides in their violins means a 1-year guarantee is also included in the extremely affordable price. Another modern violin company is Kinglos, founded in 2009. The Solid Wood Silent Violin is one of a kind, and called a “cool electric violin” by violin students on account of the custom paint jobs that they use on their instruments. As this one is under $200, it’s still affordable for any experimental instrumentalists, as it comes with an active pick, built-in to the body, which helps when it comes to amplifying for the benefits of others. This body is made from spruce instead of maple, which gives it a unique tone for any intermediate electric violinists. All in all, you can’t go wrong with a Kinglos electric violin. The quality that goes into the paintwork means that there’s minimal tone loss when it comes to actually playing the instrument. These are awesome electric violins, on account of the looks though. And when you think about it, electric violins are as much about tone and functionality, as they are about looks and showiness. We couldn’t go through a list of electric violin reviews without at least mentioning a Stagg electric violin at least once. Stagg have been a staple name in student violins since they were founded, and for good reason. Their acoustic violins have a great “quality to price” ratio, and luckily this quality has carried through to their electric violins too. The EVN Silent Violin from Stagg featured a maple body, with a 2-band equalizer, something not found on the cheaper electric violins. It comes with hard protective case too, so that your instrument is kept safe when you travel to and from your lessons, or music gigs. When it comes to advancing from beginner, to intermediate, and then onto advance electric violin playing, the Stage EVN Silent Violin is a fantastic stepping stone for any budding new violinist, as it offers a taste of what you can do with your tone, due to the 2-band equalizer, and provided headphones. Another staple name in student violins, is Cremona. If we were remiss in mentioning them in this electric violin review, then we would be at fault. Around for nearly 30 years, Cremona have been very popular with student violinists, as their quality level is high, and the sound quality from their instruments, equally high. With the SV-180E, there’s no difference in that. It features a unique hardwood body, which offers a richness in tone not found in electric violins that use plastic bodies and frames. Another uniqueness is that it features a rosewood neck, rather than the standard ebony or spruce. Due to solid wood body, it can be a bit heavier than other electric violins in the same range. As many violin teachers (acoustic and electric alike) say… You can’t go wrong with a Cremona, and in this case it’s true. It’s a little pricey for a beginner violinist, or an experimentalist. However, for an intermediate violin student wanting a richer, meatier tone for their playing, this is definitely the instrument to go for. Here’s a surprising one to be sure. When someone says “Fender instruments”, naturally you’d assume they’re talking about a guitar. However, the Fender FV-1 is possibly one of the most sought-after electric violins on the market (after the Yamaha SV-130, that is). Why is that the case? Well you see, Fender do specialize in electric guitars, and the pickups that go along with that. Because of that, the pickup is located just under the bridge, with improves both the tone and clarity of the notes, as well as the aesthetics of the electric violin. And speaking of aesthetics, this one is popular for another reason. It looks a lot like an acoustic-electric violin, as it features a full body, as opposed to the hollow frames that come to mind when someone pictures an electric violin. Can be a bit heavier than standard electric violins, due to the wood body. Most definitely the best intermediate electric violin on the market. With great sound, and attractive look, and an affordable price, any intermediate electric violinist should definitely consider this violin when looking at starting electric violin, or upgrading to an acoustic electric violin. Now we come to the section about violins where they’re more for advanced students than beginner or intermediate. The level of quality in the following electric violin reviews will rival their pure acoustic counterparts, both in quality, and in price. If you’re looking at upgrading from an intermediate level electric (or acoustic) violin to an advanced one, then these reviews are the ones you will want to be looking at. If you’re looking for an electric violin comparison at this level though, then (again) it’s going to come down to budget, and the violin itself. Coming in at under $500, is the Bunnel Edge Electric Violin. This violin comes with everything. A portable amplifier? Of course. Extra strings? Why not. Rosin and a polishing cloth? Well, those are a given. If you’re thinking about doing electric violin professionally, then this one is the one for you. The best part of it though, is the piece ceramic pickup. You’ll get incredible clarity and tone through this pickup, that’s for certain. If you’re wanting an all-in-one kit that will take you to the stage and beyond, then you should definitely consider this electric violin kit for yourself. The pickup is fantastic, the tone overall is good as an intermediate-to-advanced electric violin. 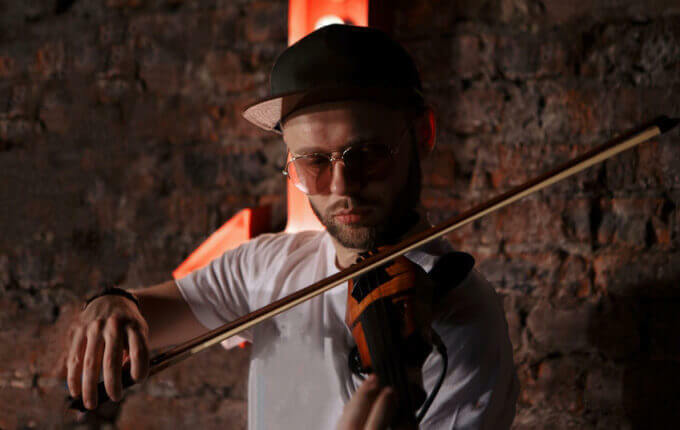 Also to be considered if you’re an experimental musician with a deeper pocket than your average joe, as it will give you everything you need to explore the sounds and effects that can be achieved from using an electric violin. 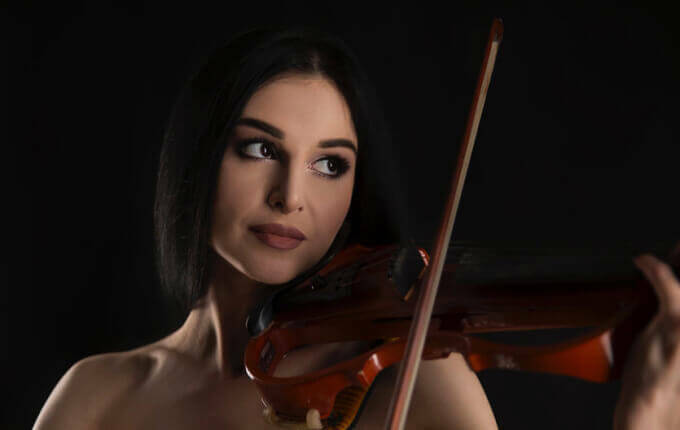 Not as well known as some of the bigger names in electric violins, Barcus Berry are still well known in the higher echelons of violin playing, being noted as providing high-quality instruments, all handmade in the country of Romania. What makes this violin so different from the rest of the electric violins in the electric violin review though, is that it’s a pure acoustic-electric violin. It’s not a hardbody, or solid frame, it’s a hollow body, with built-in pickups and a clear, concise tone. This violin carries a hefty price, but if you’re looking for quality, then this is the violin for you. It comes in a variety of colors, with a fiberglass bow, and a piezo violin pickup. As you can see above, the only real problem with this violin is the price. Everything else about it sings loud and clear about the quality of the instrument. True, it’s not for a beginner electric violinist, but it is by far the best acoustic electric violin that you can get, and if you’re looking for a violin that you can play with, or without an amplifier, then you should seriously consider this one. As you can see from the name, this violin is made for on-stage electric violinists, performers, and musicians. Although Phoenix isn’t a well known violin manufacturer either, the quality of the violin speaks for itself. It has a slim design, common amongst many electric violins, but somewhat slimmer than the rest, which makes it really stand out. It primarily comes in either black or pink, but can be found in various other color variations as well. What makes this one truly unique, is the carbon fiber tailpiece, and the multiple inputs and outputs for mp3’s, microphones, headphones, and line-out. A pure performer’s instrument, it gives the violinist clear tones, with the built-in amplifier to send the music out to the crowds. As with most high-end electric violins, the only big problem is the price. This violin however is the piece de resistance for any and all performers, which means that it’s the best electric violin for professional musicians, no questions asked, and no arguments offered. Now we would be remiss if we didn’t bring up the biggest name in modern violin manufacturers, and that is Yamaha. A household name on every violin teacher’s lips, it’s no wonder that the Yamaha SV-130 made it onto this list of electric violin reviews. It is quite possibly the most well-known of all the electric violins, and for good reason. Why is this one so unique? Because it combines the tone and warmth that you would expect from an acoustic violin, with the benefits that can be gained by playing a silent violin. It has the proper “two wood” body, with a maple neck, and spruce frame, as well as having an ebony fingerboard. It has a reverb-adjustor on the output, and a mp3-in port as well. We could probably go on for many pages on this violin, but we have to keep it short and sweet, just like a beginner violinists first concert. All in all, this is an electric violin that you would choose, if you knew that it would be the only one you would ever play in your lifetime. It has the quality of components and tone to outlast you, your children, and your grandchildren. The price goes along with the quality though, and this violin should only be bought if you know it’s for you. It might not be the top Yamaha electric violin that money can buy (yes, there are better, more pricier ones, if you can believe it), but it’s their best “beginners electric violin” in their electric violin range. Although this one technically wouldn’t be in the price range of a beginner’s electric violin, we had to add it here, as it’s quite simply the coolest electric violin that you can get. It has a transparent body, made from clear plastic. You would think “how does that make it a cool electric violin?”. Well, the body also has various multicolored LED’s built into the body, which allows the user to choose whatever color they want the violin to be, and it will shine like a beacon on stage for all to see (because let’s face it, if you had this violin…you would be on stage with it). Handmade in Brazil, it comes with adjustable treble and bass knobs, so that you can get the most out of your playing whilst on (or off) stage, as well as coming in both a 4-string, and 5-string variations. As we said above, the price for this electric violin is not for beginners, or intermediate students. It’s for advanced violinists, and onstage violin performers. The customizable colors makes it one-of-a-kind, that makes it worth the price for any and all musicians who want to stand out in the crowd. So now we’ve reached the end of this article. You’ve seen the best starter electric violin, the best intermediate electric violin, and the coolest electric violin. But which one should you go for? Well to be quite frank, that choice still lies with you. Each instrument (just like its owner) is unique, and what works for one person might not work for another. Perhaps you’re wanting a violin that will last for years, or maybe you’re just looking for a cheap electric violin to experiment on before you decide whether you’re wanting to get a decent one or not. The choice is completely up to you, as only you can read through these electric violin reviews, and then subsequently compare the electric violin reviews, and decide which one sounds like it would suit you. An electric violin is like a car. You have to choose the one that will be a combination of the most affordable, the most comfortable, the nicest sounding, and the one that will make you happiest. 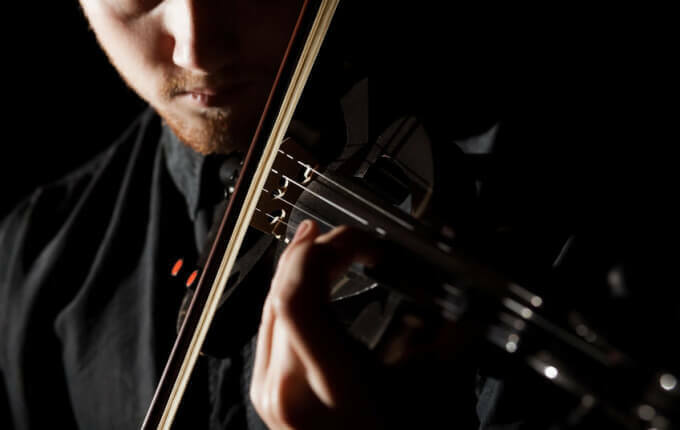 Primarily, you’re going to want an electric violin that fits the last point in that list, as that’s what playing the electric violin is all about…namely, having fun and enjoying it!